Esri's partners, customers, and international support teams have shown an undeniable and urgent interest in creating greater integration between building information modeling (BIM) and GIS. BIM has been around since the 1970s. The early BIM information technology industry tended to focus on the paper documentation that drove construction and design processes, resulting in computer-aided drafting (CAD) products that helped users create drawings. The architecture and engineering industries are moving beyond drawings toward 3D models with project-centric attribution as the focal point of communication during construction and design. 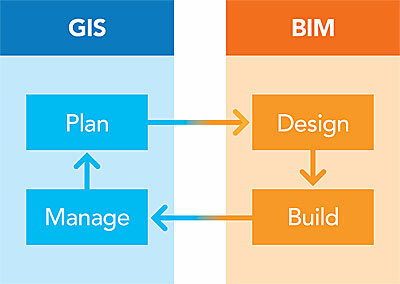 The architecture, engineering, and construction (AEC) industry now focuses more on BIM, an information-rich approach that attempts to capture project details in a robust model that may include graphics about the designed real-world asset along with rich metadata for purchasing, scheduling, and even simulation of how assets may behave in their environment after construction. BIM has become the process for increasing efficiency and saving costs through collaboratively creating and using detailed information about built assets throughout their life cycle. 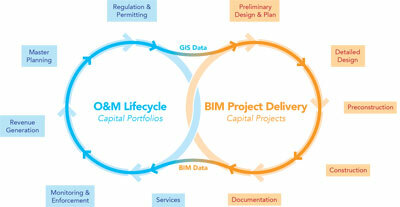 GIS and BIM are often erroneously represented as related sequentially throughout the asset life cycle. This perspective leads to misunderstanding that the interface between GIS and BIM workflows can be simplified. GIS and BIM evolved as information technologies that serve distinctly separate parts of the life cycle of the organizations that operate and build infrastructure and communities. Those organizations strive to remain within budget while achieving desired results. The traditional view of the life cycle of an asset is a sequential process. The asset is planned, designed, constructed, and then maintained. This process implies a tidy data handoff between steps, but this does not accurately represent how data flows through cities and organizations as they manage the creation, updating, and eventual decommissioning of buildings and infrastructure. A more accurate representation of the flow of data—one that is driving the integration of BIM and GIS—looks at how GIS and BIM data is used. Spatial information about assets and communities informs planning and investment. It helps find ways to accommodate change and growth in the community while maintaining the health of citizens, the business community, and the environment. Geodesign provides the framework for analysis and decision-making using spatial information and GIS technology throughout the life cycle of a community. Communities need to be able to continuously adapt to provide the services that enhance quality of life. These services include providing access to education, a healthy environment, and economic opportunity for citizens. BIM can supply more detailed information for analyzing and planning that will improve decision-making processes. As the world experiences rapid urbanization and population growth, communities have become the focal point for much of the research into the flow of information between the operational and capital asset construction workflows. Communities that meet the needs of citizens using a strategy that includes consuming, analyzing, and using information about the natural and built environments in the decision-making process are termed smart communities. Smart communities foster a data-rich environment. They make data accessible to citizen, business, and government groups while meeting privacy needs and supporting public safety. Data-rich communities work to actively or passively detect change. That change can be in noise levels, transportation needs, or utility usage. Most communities that are considered smart already use GIS. Many of these smart communities are already actively investigating BIM-GIS integration because they realize that a more streamlined flow of information between operational and construction life cycle data will allow them to more accurately plan, fund, and maintain community infrastructure assets. A more accurate representation shows that GIS and BIM data flows throughout the operational and construction life cycle of assets. The most frequently requested improvements in 3D capabilities in GIS the last few years have been for better integration and interoperability between BIM and GIS. With the introduction of ArcGIS Pro, new 3D layer types, a web-based 3D viewer, and many other new features of the ArcGIS platform, Esri has been rapidly responding to customer demand for 3D capability in GIS. 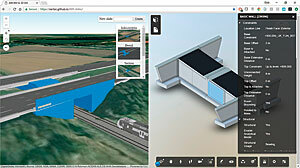 3D has become established as a core feature of ArcGIS, and thousands of users are contributing scene layers and other 3D content in ArcGIS Online as well as using new 3D apps, such as ArcGIS Earth. 3D lets users see projects and data as they appear in the real world. Most 3D experiences—especially in the consumer market—are found in gaming and interactive systems. In these systems, users need to understand their location in the real world or an immersive virtual environment. When using GIS in 3D, users expect to be able to inspect and interact with their data as if they were in a gaming environment. In 3D GIS, users often feel that they should be able to explore across scales that range from global to their front porch. BIM data is becoming widely accepted as a primary source for capturing assets at the resolution of detailed buildings and infrastructure so these assets can be represented realistically in 3D in GIS. More users are working with 3D GIS, and they expect to be able to accurately represent the world around them. Some users believe they will achieve a more accurate digital representation of their systems and environment than ever before through reality-capture information and design data. BIM information has become a critical component that many users expect to employ for accurate representations of buildings and infrastructure. On the other hand, AEC firms and other organizations that design and build capital assets focus more on the ability to stay within budgetary and schedule requirements on projects. Their ability to continue functioning depends on the degree of control they can exercise over the project delivery process. The models, schedules, and detailed asset information created during the BIM process enable better control. GIS information used as context for the designed asset’s environment offers the opportunity for BIM practitioners to achieve better outcomes during design and construction. Working with industry partners, Esri has developed a more representative model of the flow of information throughout communities, AEC services providers, and organizations that help design and construct infrastructure and assets. This model illustrates a continuous flow of information throughout all stages of the life cycle of the asset, showing that capital improvement projects initiated with GIS information help inform design and conclude with BIM information flowing back into the operational life cycle to inform analysis and planning. Esri has been rapidly responding to customer demand for 3D capability in GIS with new 3D layer types, a web-based 3D viewer, and many other new features of the ArcGIS platform, as illustrated by this web scene of the city of Philadephia. Since the dawn of digital mapping and computer-assisted drawing technology, the need to integrate BIM and GIS has been recognized. There are many classic pain points that practitioners encounter when attempting to combine design and operational data. On the design side, architects and engineers typically have difficulty accessing up-to-date GIS information for accurate context or current conditions. They often discover problems with data duplication and conflicting data because file-based workflows are used to exchange data. On the operational side, GIS staff frequently deal with difficult workflows and significant data loss that occurs when converting BIM information into GIS data layers. Differences in spatial scales and the graphical richness required in BIM environments mean that GIS staff are often asked to perform heroic feats of integration. They must attempt to merge many dense BIM models with GIS data into a single visualization and analysis experience. AEC projects typically generate large quantities of documentation during construction and after assets are commissioned that will be useful during the life cycle of assets. This documentation is often not accessible to users through GIS dashboards and analysis tools. Esri recognizes that it can’t solve these industry problems alone. Consequently, Esri has been working with multiple AEC industry vendors that are experts in BIM technology. In November 2017, Esri and Autodesk announced an industry collaboration to research and build new workflows between products from each company to their common customers to achieve better integration between BIM and GIS and address many of those pain points. Esri’s work with Autodesk will include transforming the project life cycle, providing continuous context of the site and the environment around BIM projects, and detecting site change. In addition, improvements are planned for the overall process for designing and visualizing the real world in 3D and building technologies to help optimize infrastructure operation. Ultimately, Esri’s work will encourage the use of its open platforms for innovation and sharing. Esri has made progress in providing an open platform for the flow of data. Its significant contributions to 3D technology and standards should drive innovation associated with BIM-GIS integration and, more broadly, in GIS. ?After several years of research and development, Esri released Indexed 3D Scene layers (I3S) under Creative Commons licensing as an open specification in April 2015. An Open Geospatial Consortium, Inc. (OGC) Community Standard, I3S enables the distribution of large 3D datasets over the Internet and on local devices. Bentley Systems, Incorporated, can create I3S data with its product ContextCapture and users can publish and access the data in ArcGIS Online through Esri’s open ArcGIS REST API (GeoService REST). Esri is looking forward to further collaboration with Autodesk, Bentley, and other industry leaders to help simplify workflows and improve outcomes for GIS users. 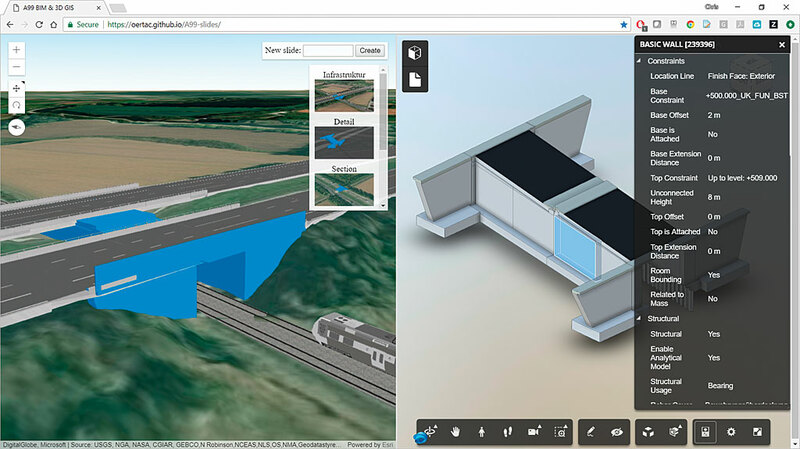 Esri and Autodesk are already experimenting with integration options such as this prototype integration of the ArcGIS Online and Autodesk BIM 360 web viewers. BIM and GIS together have the potential to lead to smarter outcomes for communities and more efficient projects for AEC services providers. This will require more than just the collaboration of software vendors. Local governments and asset management organizations will need to establish specifications for BIM information that introduce attributes early during the design process to be used later in operations and management workflows. For major urban areas, this will mean creating multiple standards across transportation, utilities, and architecture projects that may impact many agencies. Working with Autodesk and others, Esri will have to build workflows that allow users to reliably access, update, and use standardized BIM data in spatial context throughout the life cycle of assets. Work done by Esri customers and partners provides great examples of creating value from the integration of BIM and GIS information. Based on their feedback, Esri is working to make it easier for GIS professionals to query, visualize, and connect timely BIM data in familiar GIS experiences. Similarly, Esri is already working on delivering better access for architects and engineers to GIS data from within industry-standard design and construction tools. Esri users should be able to combine geospatial information, field auditing, data capture workflows, and detailed design information to achieve comprehensive awareness and understanding of the projects that will sustain and improve the world around us. Chris Andrews is the product manager for 3D across the Esri ArcGIS platform and leads a team of product managers focused on BIM, urban planning, city modeling, and globe 3D visualization. During his 20-year career, he has focused on exposing the value of GIS throughout organizations by combining cutting-edge technology with ease of use to put powerful capabilities in users’ hands without requiring specialized technology expertise. Andrews has worked with customers in the law enforcement, defense, real property, and AEC industries. He holds a bachelor’s degree in geology-biology and a master’s degree in ecology and evolutionary biology from the University of Rochester.